It appears the bulls aren’t quite done yet with Tuesday bringing the buyers back in force. In early trading, the FTSE, CAC and DAX have all opened up around 0.6% higher. Although this isn’t enough to regain last week’s highs, but it is better than yesterday’s 0.75% fall. The sentiment pendulum has swung once again to the optimistic side as confidence about the world economy causes the buyers to take interest in commodities again. Gold is at $1008 and oil is stubbornly holding above the $70 marker. It’s another quiet day on the economic news front with Canadian retail sales at 12.30 the standout economic announcement. Japanese traders still away for an extended bank holiday. The dollar is on the back foot in early trading today with falls of 0.4% against both sterling and the euro. The commodity pairs are making a comeback following yesterday’s drop in the price of oil. The Aussie is up over 1% against the US and the Canadian is up 0.64%. 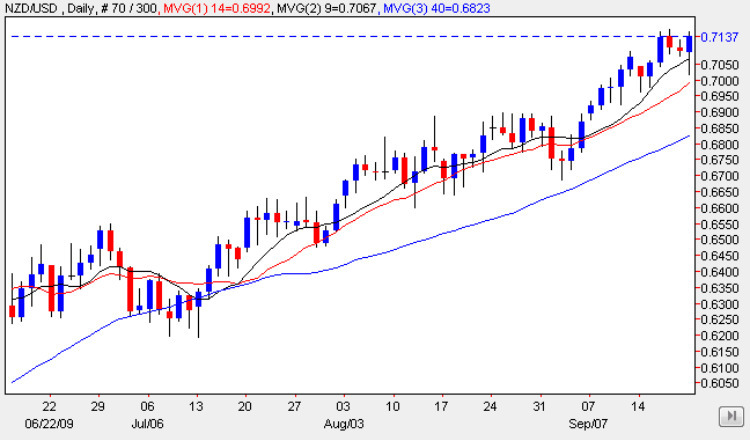 The yen is having a mixed day with big gains against the dollar, but relatively moves against the pound and euro. weeks so any upside could be limited from here. A Double (down) trade could be the best way to play this today.